I’m so glad that they really cared to look into this matter! My son is four years old and has autism. During our recent visit to Disneyland on February 13, 2013, we encountered problems with acquiring a Guest Assistance Card to accommodate his disabilities in accordance with your disability policy. This letter provides details on our disability grievance and recommendations to correct the present issues. Although many people believe that autism is an invisible disability, this is only true for those persons not living with this handicap. Sadly, it’s not invisible in our home. It’s present in every moment of every day. It has been ever-present since the time my son was just 15 months old and started an aggressive array of early intervention therapies that included over 35+ hours of hard work each week. From the time my four year old wakes up to get ready for school and needs to be walked through a series of picture-story strips to guide him in all steps required to dress, potty, brush teeth, and wash hands to setting up the day’s visual schedule before the small, yellow bus pulls up to our house. It’s present in the large amount of social stories I must create to explain routine social situations and processes to my son; and even present in a public restroom where my son has trouble tolerating the barrage of overwhelming sounds from toilets flushing and hand dryers blaring as my son runs to the furthest corner, squatting down and covering his ears with little hands while tears stream down his face due to sensory dysfunction. Yet, to most people, my Wyatt appears to be a normal enough little boy. Wyatt’s invisible disability emanates from a combination of visual, social, and auditory communication challenges, as well as sensory dysfunction, echolalia, poor gross motor coordination, low muscle tone, OCD, and severe anxiety. You only need to pay closer attention to see how this adversely affects his ability to communicate his needs, wants, and fears on a daily basis. He works very hard every day to overcome these disadvantages and challenges at school for five hours and then another two with a private teacher in our home. We don’t often get to experience family vacations due to his demanding schedule of occupational therapy, applied behavior analysis teaching, speech, and other commitments. However, we are happy to make this sacrifice in the hopes that he will learn how to communicate, cope, and grow into the amazing individual we know he will be. Guests can use an alternate attraction entrance, where available. Guests can use their stroller as a wheelchair. This year, we were told by the Customer Relations representative in City Hall that the policy was different this year and that each attraction would make the necessary determination of how to accommodate our son’s disability. We were prepared with supportive documentation that included a letter from my son’s doctor, recent occupational therapy assessment results that provided specific details on his sensory dysfunction, and also psychological and educational communications from his school because we faced similar challenges in receiving the guest assistance required for our one day from Disneyland Resort’s 2012 Community Involvement program. However, this representative would not even look over the paperwork supplied. He grudgingly permitted us the, “Guests can use their stroller as a wheelchair,” and remained firm on his statement that the alternate attraction entrance policy was now different. Not getting anywhere and with a four year old already on the brink of meltdown due to the City Hall delay, we decided that we would give this a chance and see if we were worried over nothing. The remainder of our morning was fairly decent until we crossed over to the California Adventure to experience Cars Land. At Cars Land we experienced every ride breaking down, including Luigi’s Flying Tires just minutes after we finally boarded. My son waited in line to meet Lightening McQueen only to be told when it was finally his turn that McQueen needed to take a break and that he could stay and wait for Mater. (Meeting McQueen was my son’s primary motivation for visiting Cars Land.) Later my son spotted Red, and we made a beeline to visit this character only to see Red backing away for another break right as we arrived. This resulted in our fifth massive meltdown of the day and my son requesting to leave Cars Land and just go home to play computer. It was very sad to see that magic gleam – that just about every kid possesses while at Disneyland – dim so, as he insisted we leave because he was disappointed. Now, I know that it’s impossible to predict what mechanical problems might arise regarding rides throughout the park, I found it odd that the only three present in Cars Land were on the fritz. Additionally, I’m still scratching my head wondering why the animatronic cars characters required so many frequent breaks? I want to understand why it’s so difficult to obtain the Guest Assistance Card with the supportive measures my son requires to have a good time at, “The Happiest Place on Earth?” Why are parents treated as fraudulent liars when they bring official documentation to prove their son’s disability and challenges? Furthermore, how can these judgments even take place when your staff refuses to look at the clear, black and white information placed in front of them?! It is crystal clear to me that we would never receive the supports we need if we merely stated that, Our son possesses a medical condition that makes it difficult for him to tolerate crowded areas with loud sensory experiences as your policy advises. In today’s world, where 1 in 88 children are diagnosed with autism, how is this not a more recognized disability at City Hall? It makes me wonder about adults living with such disabilities that must advocate for them self at City Hall. How are they able to negotiate the supports they require without the secret language that must be required by Disneyland Customer Relations representative staff in the midst of lesser social skills and perhaps even a disadvantaged ability to clearly articulate their needs? I hope that this will not be an issue in any future trips to Disneyland. It is a shame that my son’s single day at Disneyland this 2013 was fraught with so many unfortunate mishaps and failures to meet his needs. If anyone takes a moment to Google disability complaints with Disneyland it’s very apparent that there are large numbers of families coping with similar issues around the nation. Please take the time to educate all staff of the invisible nature of autism and its substantial challenges. Sensory dysfunction is real. Receptive language disorders are real. Crowd-induced anxiety and resulting aggressive behavior is real. Autism is not an invisible disability – you only need to open your eyes to see the need for greater understanding and awareness. 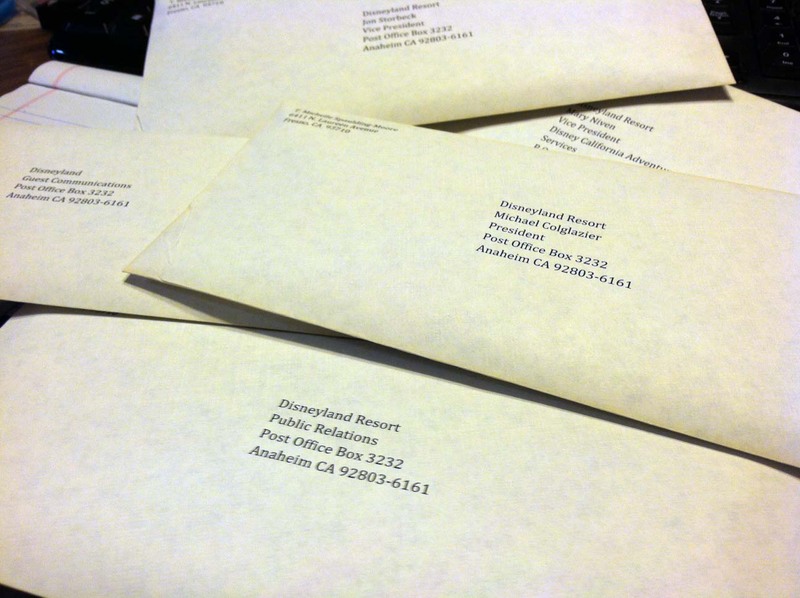 Here’s the heap of letters I’m sending out to top Disneyland executives. I hope that someone reads my letter and considers the need for improved training of City Hall cast members. Oh wow. Did they really your family that way? As an adult with Autism, i know it’s not just an “invisible disability. Your little boy deserved so much better. Have you thought about a petition? Take a look at this site. http://www.change.org/ Hopefully your son’s next trip to Disneyland will be better. We’ve had a troublesome time getting a GAC with the alternate entrance provision for the past two years. It really angers me that City Hall is so disbelieving and indifferent when it comes to autism. Yesterday I received a call from the President’s executive assistant. They are looking into the matter and discussing it. She also stated that he will phone me next week to discuss. I am hoping that they truly care enough to remedy this problem. Thanks for your comment & support. I’ll see where this call ends the matter and will remember the petition suggestion if the discussion next week is not favorable. Right now I’m just overjoyed that the Presiden of Disneyland received and read my letter! My family is planning a Disneyland trip for late 2014. I have a 9-year hyperactive non-verbal son with autism. Weʻve never even thought Disneyland could be a possible vacation destination because of my sonʻs aversion to crowds, but last year he thoroughly enjoyed our State Fair and all the rides, that the thought of going to Disneyland with him and our other children became a possibility. I would appreciate any tips you may have on going to City Hall for this GAC. Hello! I wish your family the most wonderful time on your trip to Disneyland! My best advice is to be specific, calm, and stand your ground. We always request a GAC featuring permission to use our stroller as a wheelchair (this helps our son to maintain a safe & comfortable environment – despite the crowds) as well as permission to use the alternate entrances. These are two separate stamps and if they try to tell you that they’ve phased out the “alternate entrance” stamp, don’t believe it. The alternate entrance stamp enables your son to enter attractions using the handicap entrance so that they can wait in a less crowded and often shaded area. If you also have the stamp indicating you can use a stroller as a wheel chair, you won’t have to park your stroller, but can wheel it right up to this entrance – just like anyone in a wheel chair. We prepare him by creating detailed social stories, watching videos on YouTube, and talking about what our son can expect. Please let me know how it goes – I hope it’s an awesome vacation! This really upsets me. I’m planning on taking my two year old nephew who has autism to Disneyland this just breaks my heart. I’m afraid we will be denied the Guest Assistance Card because so many people think he’s just a two year old acting out and don’t understand his disability. Do you have any tips or suggestions? Should we provide medical documentation? I am very upset by these developments as well and am trying to get more information from Dland, but they’re not ready to reveal any specifics yet. It’s very frustrating and I hope that they are listening to the many comments they’ve already received. Even before all the emerging changes it was difficult to get a GAC for my son. Bringing medical paperwork doesn’t really help because they will refuse to read it. The only thing that’s worked for us was to hold fast to what we needed and continue demanding the GAC – asking for the next manager and the next…until we got what he needed. It’s not easy and their City Hall staff does have some issues with discrimination when it comes to “invisible” disabilities, like autism. Try to be strong, clear, and commanding of what you need for your son. I’m not sure how these new changes will affect all of us. If the news that has been leaked so far is true, it will worsen this, not make it better. I plan to write a full post on this very soon. I’m waiting to see if I can get more details from my contact at Disney, but I do encourage everyone to call and write them with concerns. The more they are flooded with concerns for these changes, the more likely they are to listen and adapt the new program in ways that could work. I wish you the best of luck. We also have a trip planned for February, so I’m watching this very closely also. Adulterated Foods – Say What? !